As a frequent intervener with the Government of Canada, York University is required to submit reports to the Office of the Commissioner of Lobbying of Canada each month during which a representative of the university meets with any elected federal official, a member of their staff or a senior bureaucrat (Director level or higher). These meetings must be reported whether they take place in person, or by phone. According to federal regulations, any such contact must be reported to the government through the Office of the President. 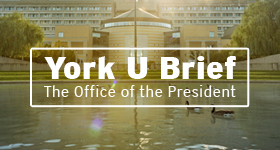 For this reason, senior administration and managers at York are canvassed monthly by the Office of the President for any federal lobbying activity. This information is submitted to the Office of the Commissioner of Lobbying within 15 days after the end of the month in which the contact took place. Failing to comply with lobbyist reporting regulations will result in severe penalties for the University according to Federal law. Importantly, these reporting requirements also apply to any third party that is retained to advocate on behalf of the University and receives compensation for their efforts. (Members of university Boards of Governors are generally not impacted by this rule in performing their normal role). For more information, you can read the Lobbyists’ Code of Conduct and search the Lobbyist Registration database. If you would like to report a reportable contact with the Federal Government please use this form. 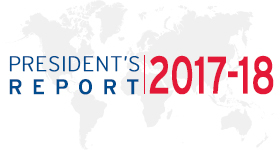 Activities must be reported to the Office of the President by the 10th of the month after the activity occurred. For example, if a meeting took place on March 14, it would need to be reported by April 10. York University is also a registered lobbyist with the Office of the Integrity Commissioner of the Province of Ontario. As a registered lobbyist, the University is not required to submit reports but must renew the information on its registration annually to ensure details about our lobbyist activity is up to date. For more information and to search the Lobbyist Registration database, please visit the Office of the Integrity Commissioner’s website.